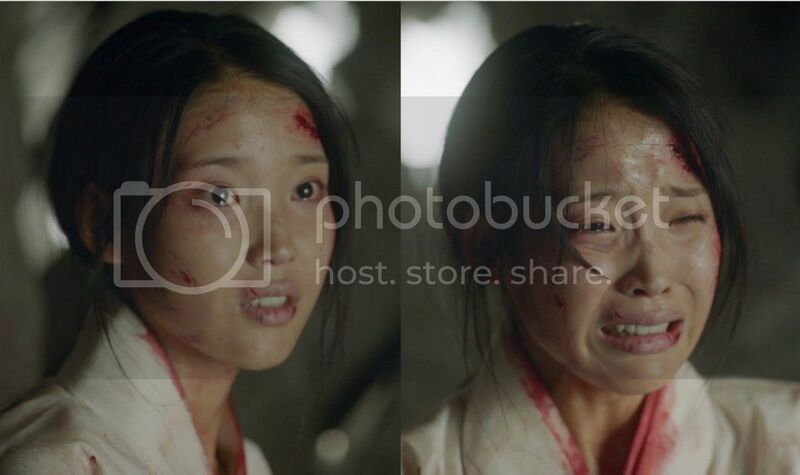 Based off where episode 9 ended, these stills allows us to extrapolate what may very well go down tomorrow and it doesn’t look too good for Hae Soo. In fact it promises to be a bad episode for Hae Soo with the silver lining being that So will step in to be her hero, and hopefully advance their loveline. It will most likely pick up from that kiss that received mix reviews, but from this image one could glean that she was feeling a spark of attraction if not something more. Truthfully I hope this is her heart skipping a beat for a romantic awakening and not an up tick in her fear of So, because her fear of him is tiring at this point and I want to move on to more interesting things. This week we will see both So and Hae Soo be thrust into the line of fire as So drinks the poison intended for the crown prince, making good on the promise to block his mother’s plans to assassinate the crown prince. Hae Soo, of course, receives the blame and is imprisoned. There is no doubt that Hae Soo recieved a beating in prison or during interrogations just as there is no doubt that Wook’s plan to marry Hae Soo has been put to the end as she is now a criminal awaiting her death. This may be the end for Wook and Hae Soo, but maybe the beginning as for her and So when he steps up to shield her from the rain as she begs for her life. Again I hope she begins to see him in a new light, because as the preview suggests they will be on the run and it will be uncomfortable to watch if she spends most of that time shaking in fear. I hope the production staff handles this in a way that the romance is believable as well as enjoyable. Also I am looking forward to seeing how they bust Hae Soo out of prison, in addition to how they will bring about Hae Soo and So’s return into the palace. I think his willingness to drink the poison…the third time he’s been willing to give up his life for the crown prince…will be the changing factor of Soo’s fear of So. Clearly, he’s not intending to take over the crown prince and kill his brothers if he’s continually laying his own life down. I think she will finally see this and when they go on the run, the love-line will blossom. I’m really looking forward to the truth behind the stills – the production company has been so sneaky about combining scenes that may or may not be connected. The iconic of scene of him shielding her from the rain is the same in the C version. I hope their loveline move along at a faster pace. reading your take on the preview stills, I am scared to watch tonight’s episode! But it felt like ages, waiting for Monday, I guess I’ll have to be courageous like SooSo couple and face the trauma head on. Fighting SooSo!!! Aishteru!! Gambatte! !